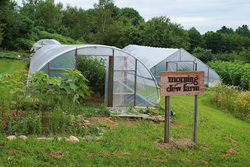 CSA: Community Supporting Arts aims to promote both local art and local food by partnering 14 artists with 13 CSA (community supported agriculture) farms in and around central Maine. The artists have been creating art inspired by their farmers’ lives, work, landscapes, challenges and ideals since the beginning of the growing season in early spring 2012. The project culminated in 8 art exhibitions on view between Oct 2012 - Feb 2013. CSA: Community Supporting Arts is a project of the Harlow Gallery in Hallowell (owned and operated by the Kennebec Valley Art Association, a 501(c)3 membership based organization) and the Kennebec Local Food Initiative of Gardiner that strives to strengthen community food security through access, education, information and advocacy. Tyler Gulden is featured in this video produced by Art Mayers to document artists and farms involved in the project. Morning Dew Farm and Tyler appear at the 14:13 mark in the video.